Guitar Hero: Warriors of Rock (initially referred to as Guitar Hero 6 or Guitar Hero VI) is a music video game and the sixth main entry in the Guitar Hero series. It is the last game in the series to be developed by RedOctane and Neversoft prior to dissolution and closures by their parent company and publisher Activision, in part as a result of weak sales in the rhythm game market from 2009. 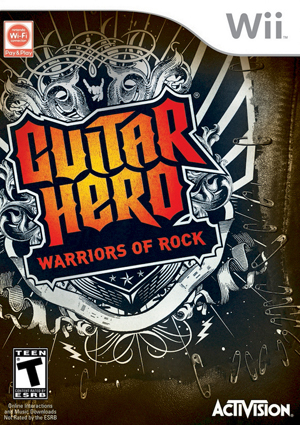 Additional development for the Wii version was provided by Vicarious Visions who were to take over future development of the Guitar Hero series before it was placed on hiatus. Dolphin lacks support for connections with a Nintendo DS or 3DS. There is a texture problem with instruments unless EFB Copies to Texture Only is disabled. After a song starts EFB Copies to Texture Only can be re-enabled to restore performance with correct textures. Only configuration options for the best compatibility where they deviate from defaults are listed. The graph below charts the compatibility with Guitar Hero: Warriors of Rock since Dolphin's 2.0 release, listing revisions only where a compatibility change occurred. This page was last edited on 24 February 2018, at 15:42.